My husband came home with the biggest smile on his face! We've been decluttering with Craig's List classifieds lately. Yesterday we sold a Giant bike for $40. We had bought it for $5, only to find the frame was too small. Today I suggested he stop by Salvation Army after dropping off evaluations across town. As he walked in, a worker was wheeling out this Trek 720 Multi Track bike. The price? $40. After complimenting his bargain-finding prowess, I ran inside to Google. 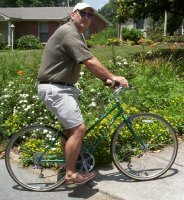 According to this Craig's List posting, the Trek 720 originally sold for around $600. 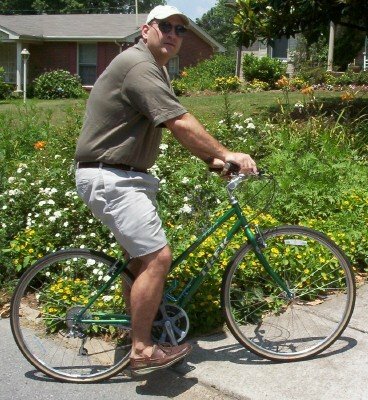 Now my husband has a top quality bike for our original $5 seed money! Ouch-my DH has a Trek in the garage and we paid the full price a few years ago. He loves it and rides it often but definitely not a steal. Plus, it doesn't help that in true absent minded professor mode he will ride it to the college in the morning and then leave it there and walk home at night. Completely forgetting that he rode it. Wow! That's some deal. And who cares about the whole girl/boy bike thing, anyway? That's so neat! Last night, at a company barbecue, we met one of DH's co-workers who buys and re-sells campers. I'm pretty sharp with retail deal-finding, but I'm not as hot with used stuff. I admire people like your husband! That's great! This is going to sound a little weird, but your husband is the only man, other than my father, I've ever seen wear deck shoes like that. PS - That was an impressive feat of frugality. $5 for a $600 bike! This may sound interesting I was just searching online for the value of my trek 720 multitrack that I bought at the local good will store for $30 a few months ago and all it needed was air in the tires and it was ready to go, I love the bike is so light weight and feels very sturdy and safe that I wont sell it or trade it for anything. Greetings from San Pedro, California.